Life can be hectic! So we wanted to give you the resources to show all your favorite loved ones how much you care! These last minute Valentine’s Day ideas will help you accomplish all that loving, with a little less stress! 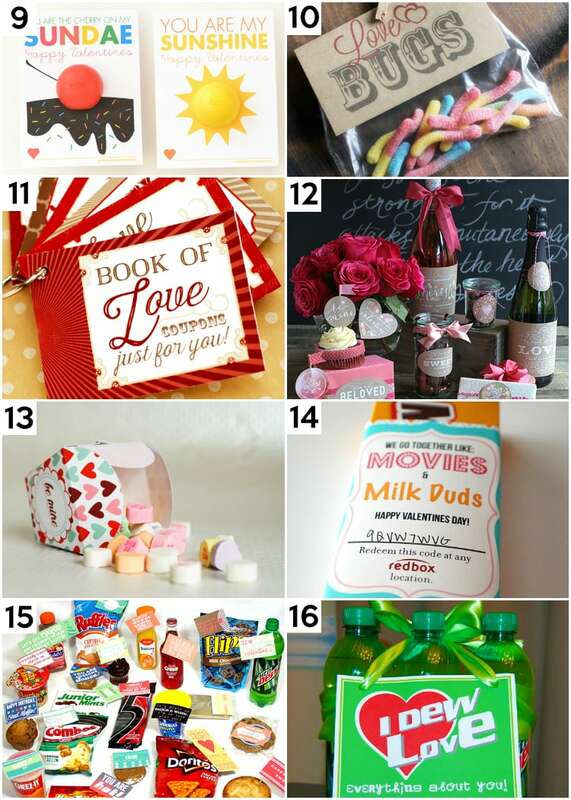 These clever and last minute Valentine’s Day ideas are sure to be a hit for all the loved ones in your life. 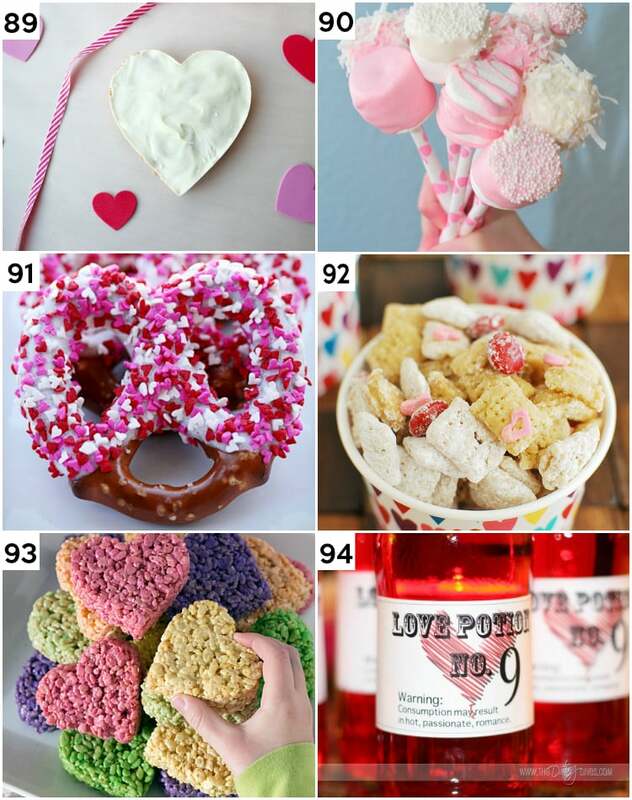 We have tons of easy and clever ideas ranging from DIY Valentine’s Day gifts, love-themed wall art, crafts and activities for the kiddos, to fun and romantic Valentine’s Day desserts! All of these Valentine’s Day ideas take 30 minutes or less to help you with that last minute Valentine’s Day planning! 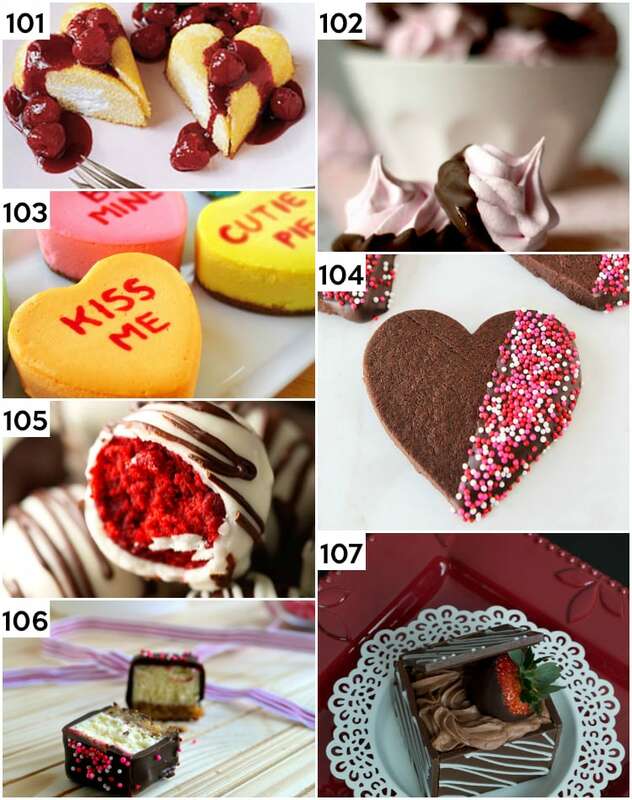 That’s 115 fun, easy, and simple Valentine’s Day Ideas for you to choose from! See? We told you Valentine’s Day doesn’t have to be complicated, it just has to be meaningful! And who says that meaningful needs to take a lot of time. Now, let’s dive into these last minute Valentine’s Day ideas, shall we? 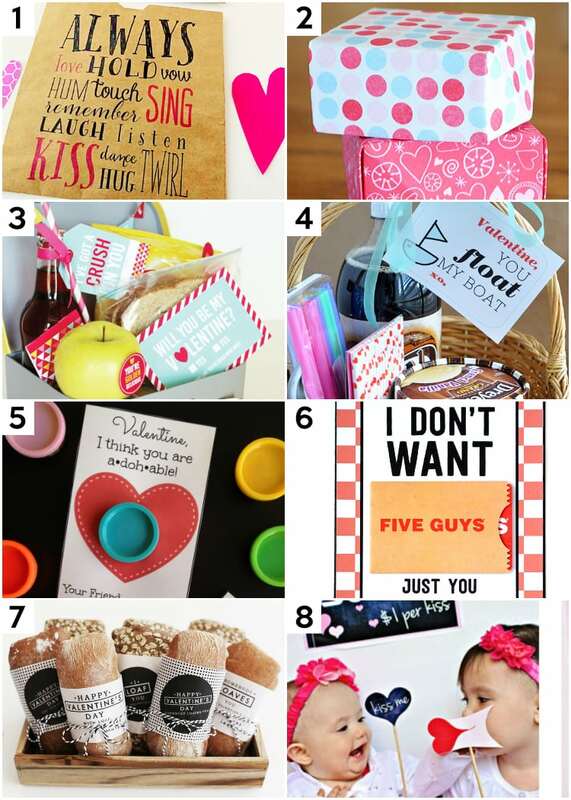 Printable Valentine’s Day ideas are always a hit! For a very low cost, you can get these simple Valentine’s Day ideas in your hands within minutes. Just print, prep, and you’re done! If your kids need a fun Valentine to pass out at school or you want to deliver presents to friends and neighbors, these printable and last minute Valentine’s Day ideas are so clever and fun! We even have some awesome printables that make great last minute Valentine’s Day gifts for him, too! 1. CD Sleeves – These CD covers made with Kraft paper would make giving the gift of music absolutely adorable. 2. 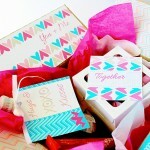 Printable Boxes – Make your own boxes to put fun little treats in. 3. Love Lunch for your Spouse – What an adorable gift to make your spouse’s lunch something special. 4. Root Beer Float Kit – For those who love root beer, this would be the cutest little gift. Tip: you’ll want these Avery postcards! 5. A-Doh-able – Play-doh is the perfect non-candy treat that will bring a smile to everyone’s face! 6. I Don’t Want 5 Guys – Just you. The perfect gift for the burger lover! 7. Somebody Loaves You – What a cute Valentine’s gift to share with your friends. Who doesn’t love a nice fresh loaf of bread!? 8. Valentine Kissing Booth Props – Time for some picture fun! 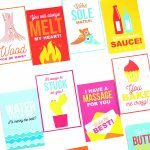 These printables are so cute! Don’t forget the dowels! 9. EOS Lip Balm Valentines – Spread the love with these darling EOS lip balm printables. There are so many fun options. 10. Love Bugs – This is such a silly and fun printable that complements these super fun candies. 11. Book of Love Coupons – If you don’t have a coupon book, you need to grab this one quick! Everyone loves receiving coupons! 12. Vintage Party Printables – The party is starting! These gorgeous printables will make any party a hit! 13. Take-out Boxes – Deliver someone a favorite treat, take-out style. Plus, you know, Necco Conversation Hearts are a Valentine’s Day staple! 14. Movies and Milkduds – For movie buffs, this Redbox printable gift is perfect! 15. 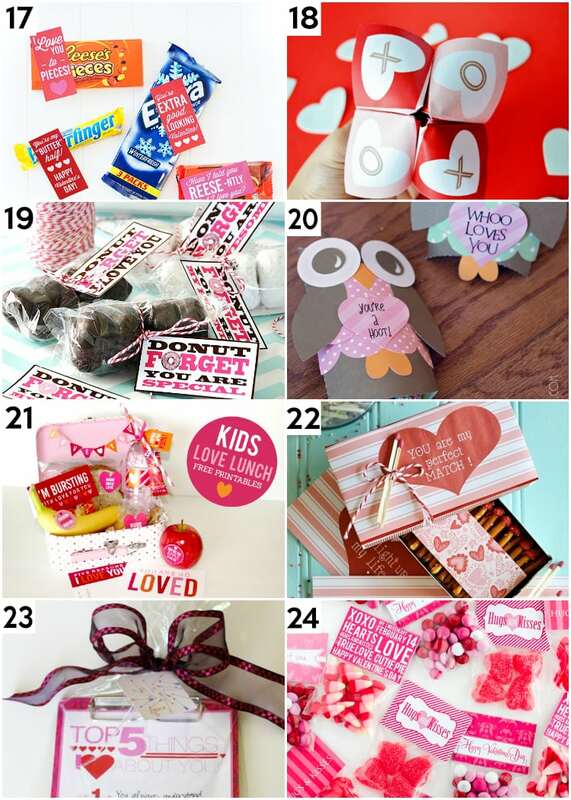 Valentine Snack Notes – Attach some notes to your family’s snacks to show a little extra Valentine’s Day love! 17. Candy Bar Love Notes – Give everyone their favorite candy bar with a little love note attached. So easy! 18. Valentine’s Day Emergency Kit – Oh, how cute! This emergency kit includes a cootie catcher, Valentine’s menu, and everything you need to make a candy bouquet. 19. Donut Forget – This is such a cute little saying and could make for an adorable little breakfast or snack for Valentine’s Day. 20. You’re a Hoot! – Fun owl-themed printable gift box. There are a couple different versions to choose from! 21. Kid’s Love Lunch for Valentine’s – Make the kids’ day by going all out on their lunch. It will be so easy with this printable pack! 22. Perfect Match – Okay, these are the cutest. You have to check out the “You Light Up My Life” ones… So fun! 23. Top 5 Things about You – Let your sweetheart know the Top 5 things in a cute way! Easy and romantic. 24. Treat Bag Toppers – Adorable pink treat bag toppers to share with everyone. PS – isn’t Cupid Corn so cute? It would be perfect with these! 25. Gifts by the Hour – Make Valentine’s surprises last all day long. 26. Love is in the Air – Another super sweet, easy and fun printable. 27. Man Approved Valentine’s – Some of these are so funny. I’m sure you’ll find something to make your man smile here. 28. You Blow Up My Heart – A fun gift to make for the kiddos! 29. Chalk Art Labels – These are so adorable. I love this style! For labels, you’ll want some of these, these, or these. 30. 14 Unique Valentine Cards – I guarantee you’ve never seen cards like these before. If you like to be creative but don’t have the time to tackle a big project, h ere are some fun and simple DIY Valentine’s Day projects! Just because it’s last minute and DIY doesn’t mean it isn’t meaningful. Sometimes it can mean quite the opposite! We’ve got awesome DIY last minute Valentines’ Day gifts for kids, for him, for her, and for everyone in between. 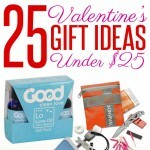 Simple Valentine’s gifts is where it’s at and we’ve got you covered right here. 31. Candy Lollipops – A bouquet of these pretty flowers using Tootie Pops would be a great way to brighten up any table! 32. Candy Pouches – These are so cute. I love how bright and colorful they are! 33. Pink Sugar Scrub – An easy, adorable and practical gift for someone you love using ingredients like fragrance oil and coconut oil. 34. Block Puzzle – This puzzle doubles as a fun gift and pretty decor. I love it! 35. Secret Message Puzzle – Such a simple gift! This secret message puzzle is so fun! 36. 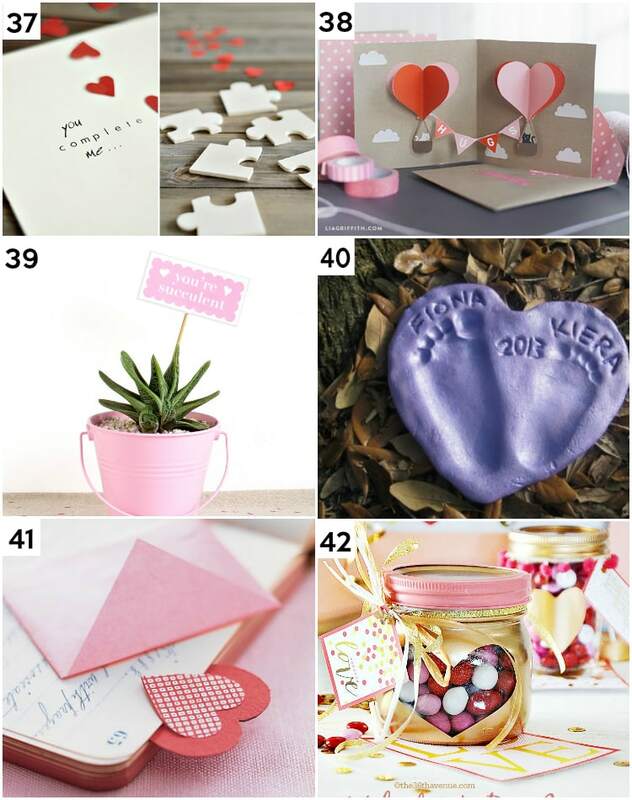 Valentine’s Huggers – The kids would love to help make this cute and simple gift! 37. 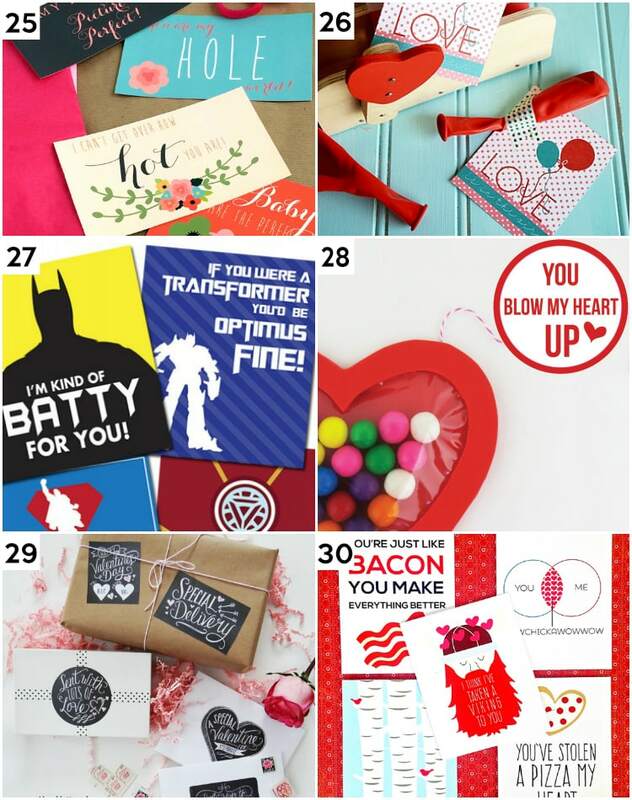 You Complete Me – You’ve got to check out these adorable ideas. This is such a fun and romantic gift! 38. Valentine Pop-Up Card – Set this up for your spouse to find in the morning. How cute! 39. Valentine’s Planter – Love this clever idea! Succulents are so pretty in the home… Give this to someone you think is succulent. 40. Footprint Heart – A gift that will leave a lasting impression and many memories! 41. Heart Bookmark – Help the person you love keep tabs on a good book that they love. 42. Heart Jars – CUTE… Right? I would love this pretty jar filled with my favorites–Reese’s Peanut Butter Cups. Another great gift you can customize! Want some easy decor to brighten up your home this Valentine’s Day? After all, with all of the Christmas decor down, the house is probably starting to look a little bare, am I right? 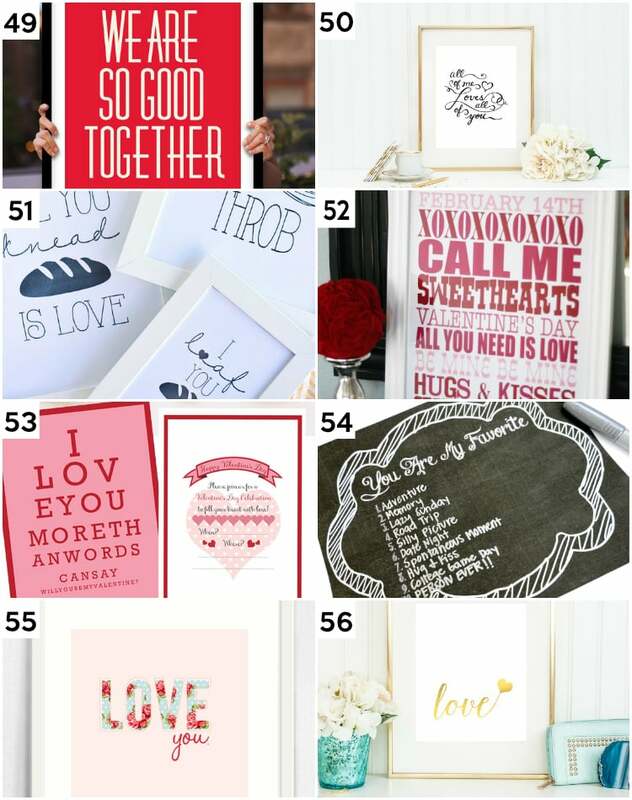 Well, these Valentine’s Day wall art printables are perfect for the month of love! And if you’re wondering what makes these last minute Valentine’s Day ideas… well, just print, frame, and you’re all set with a super easy and simple Valentine’s Day idea that is bound to help you ring in the holiday! 43. You Are Loved – A cute piece of art with a simple reminder… Plus, 8 more beautiful Valentine’s Day printables. 44. Today I Have Loved You for… – This wall art is a personal gift with a significant meaning. 45. I Love You Because – Cute posters to express your love for your spouse or kids! 46. 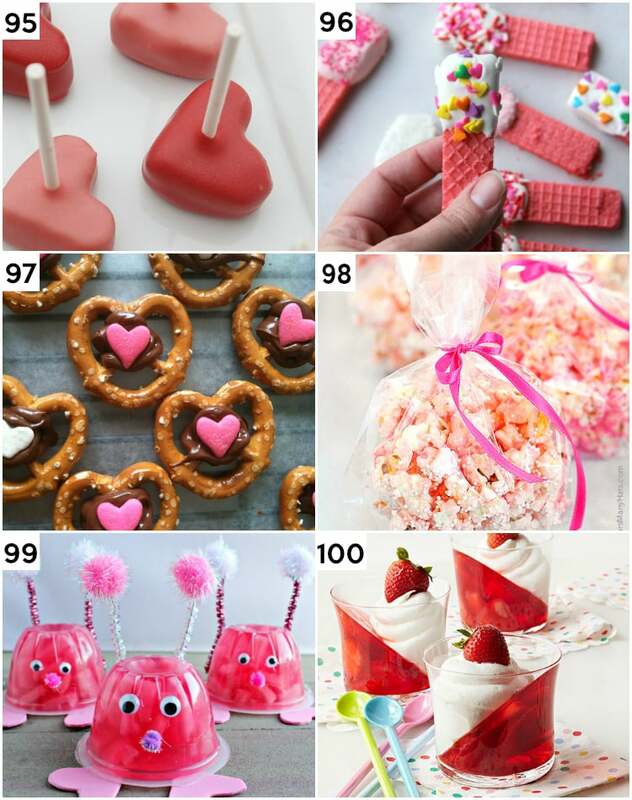 Sprinkled with Love – An adorable party printable for your Valentine’s Day celebrations. 47. I Love You Deerly – I love these unique and absolutely gorgeous cards! 48. Love You to the Moon and Back – Wouldn’t this printable be so cute for the kids? 49. We Are So Good Together – This giant wall art is perfect to really display your love. 50. All of Me – These lyrics make for a gorgeous piece of wall art. 51. I Loaf You – Food puns for the kitchen! I am definitely printing these out to adorn our walls! 52. Subway Art – This style of art is so fun. 53. Eye Exam – See if your love can pass an eye exam. This is such a fun idea! 54. You Are My Favorite – Make your own art by telling your loved one why they are your favorite! 55. Love You – This is the prettiest wall art. I love the floral pattern on the word love. 56. Love – A simple and beautiful gold love. 57. Couples Subway Art – The greatest love stories ever, all on one piece of subway wall art. 58. Unique Heart Art – A unique idea using two frames. This heart art would look cute on a shelf or mantle. 59. Donut Ever Let Me Go – This printable is the cutest. Pair it with a sweet doughnut breakfast and you’ll be set. 60. 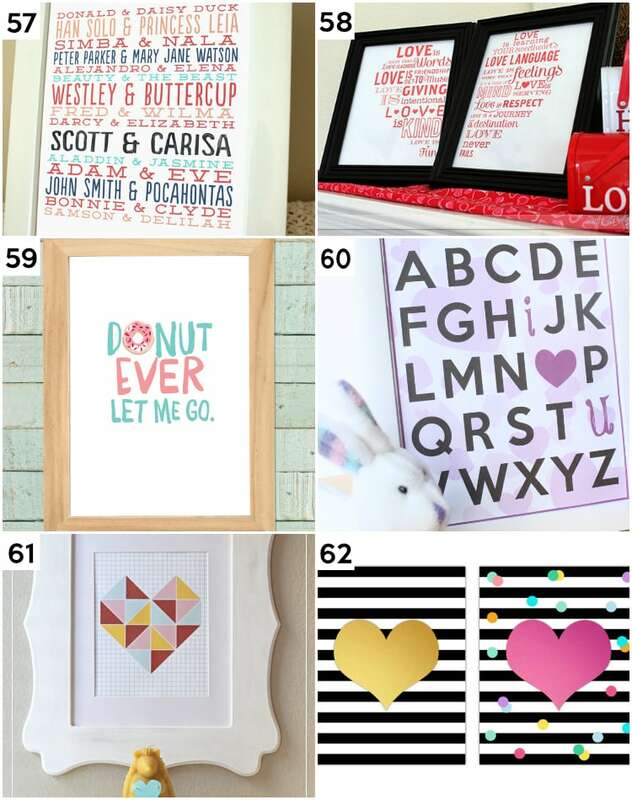 Alphabet Printable – This is such a pretty printable that would look great on a kid’s shelf. 61. Geometric Heart – I love this fun geometric heart printable. 62. 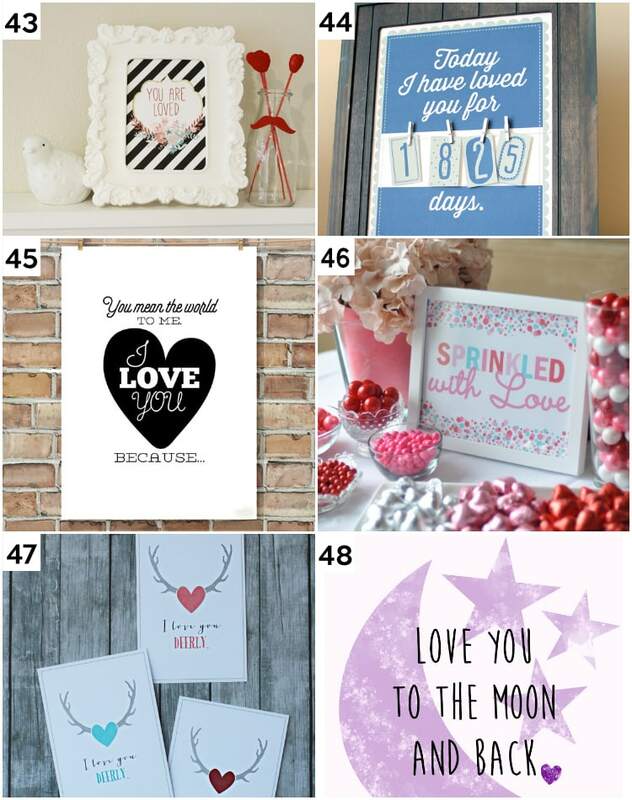 Love Collection – 4 bright and pretty heart posters. Have a couple of minutes to sit down and do something with the kids?? Great! That’s all it takes. Valentine’s Day is such a fun holiday to celebrate with the little ones! It helps teach them out to think of others and express how they feel about their friends and teachers! 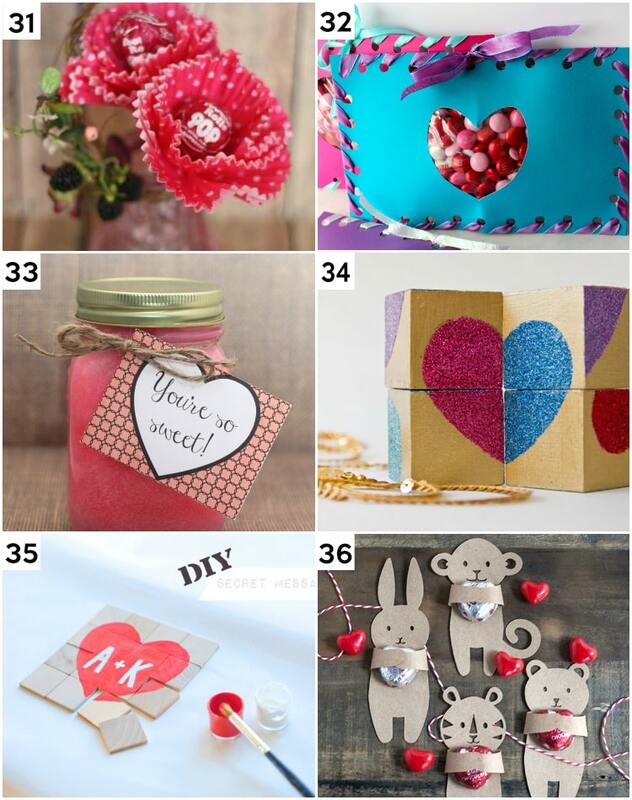 These Valentine’s Day crafts are fun and easy to make. They are sure to help bring a little laughter and love to your life! 63. String Hearts – This is a fun fine motor project for the kids! 64. Heart Hats – What a fun and easy craft project using a paper plate for the kiddos. Plus you can get some great pictures too. 65. Candy Heart Stack – Put all those candy hearts to good use with this fine motor activity. 66. Lighted Heart Jars – These lighted jars using lights like these would be fun to make and display around the house… maybe even as a nightlight! 67. Heart Shaped Animals – This is a cute paper craft! Check out all the heart shaped animals you can create. 68. Heart Magnets – Heart magnets for displaying little love notes! 69. 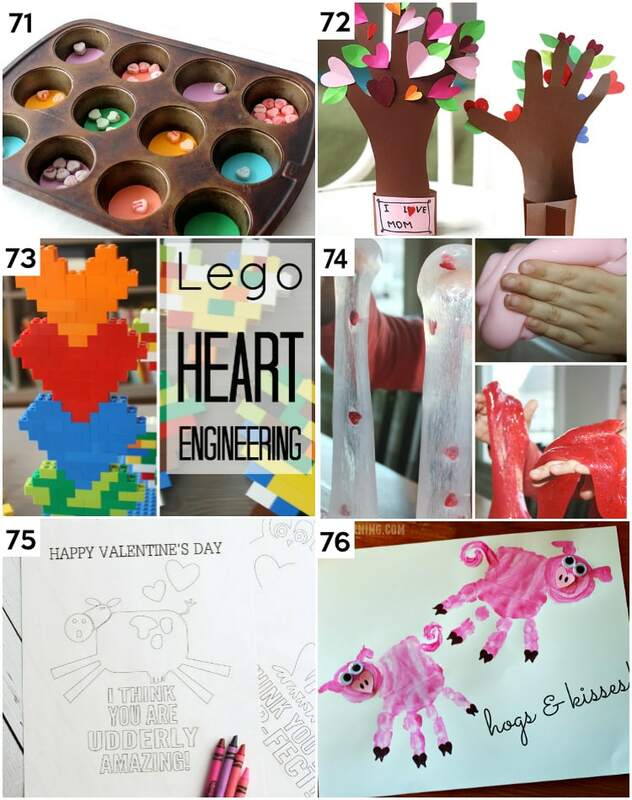 Heart Candy Pick-up – The ultimate fine motor activity… this would be a fun challenge for older kids. 70. Tissue Bleed Valentine – Such a pretty and simple craft activity using bleeding tissue paper. 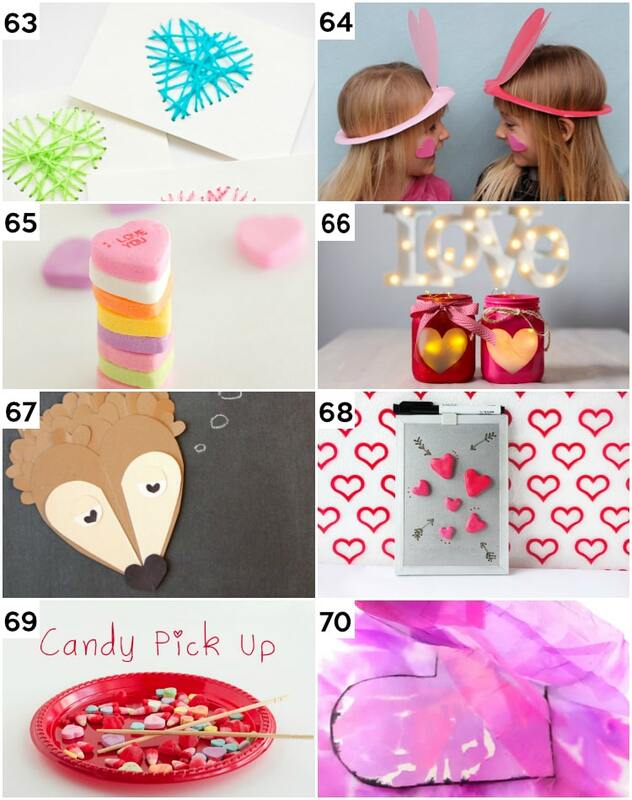 Get the kids involved and make some fun hearts to display for Valentine’s day. 71. Candy Heart Sorting – This is a great activity for little ones to sort out different colors of candy hearts. 72. Flowering Heart Tree – What a fun craft that could double as a cute card or gift. 73. Lego Hearts – What a fun way to display your love on Valentine’s Day using Classic Lego… or just a fun activity! 74. Valentine’s Slime – Slime just takes a few simple ingredients (like Elmer’s glue) and is always fun to play with… add a little color, some Valentine’s confetti, and it will be a Valentine’s Day play day. 75. Valentine Coloring Pages – These pages are so cute and could make for a fun art project. Finish it up and give the finished piece to someone you love. 76. Hogs and Kisses – Make a hand-print and turn it into a pink little piggy! 77. 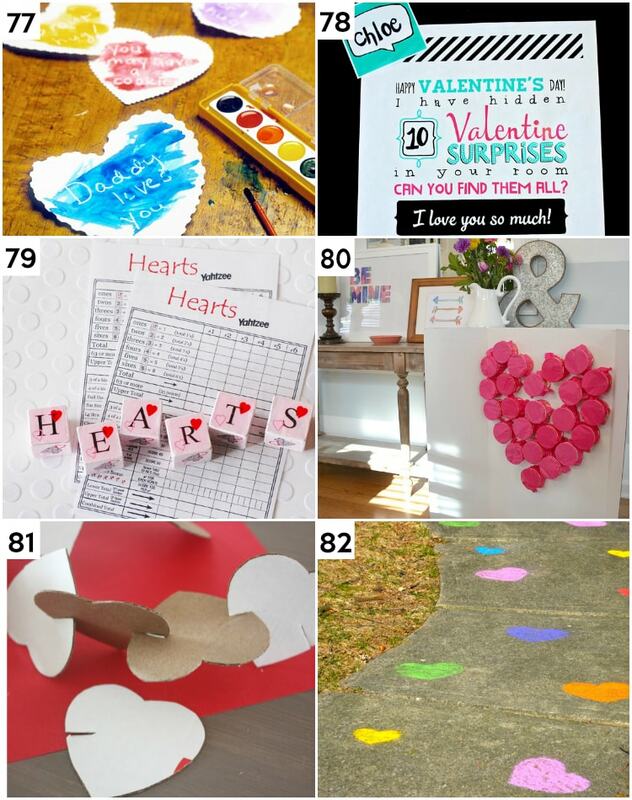 Valentine Secret Messages – Leave a secret message that your kids can find during arts and crafts. 78. Search and Find – Play a fun little game with your kids by hiding some treats for them to find. 79. Heart Yahtzee – A fun game for Valentine’s day using simple wooden blocks like these. 80. My Heart is Bursting – This activity would be fun for a big group of people. 81. Cardboard Hearts – Make a cardboard heart chain. 82. Curb Appeal – Send the kids outside to decorate the front walk with hearts! Who doesn’t want to enjoy a few festive treats?? I mean, what is Valentine’s Day without some sweets! And if you can’t get ANYTHING else done, these last minute Valentine’s Day ideas are sure to put a smile on everyone’s face. 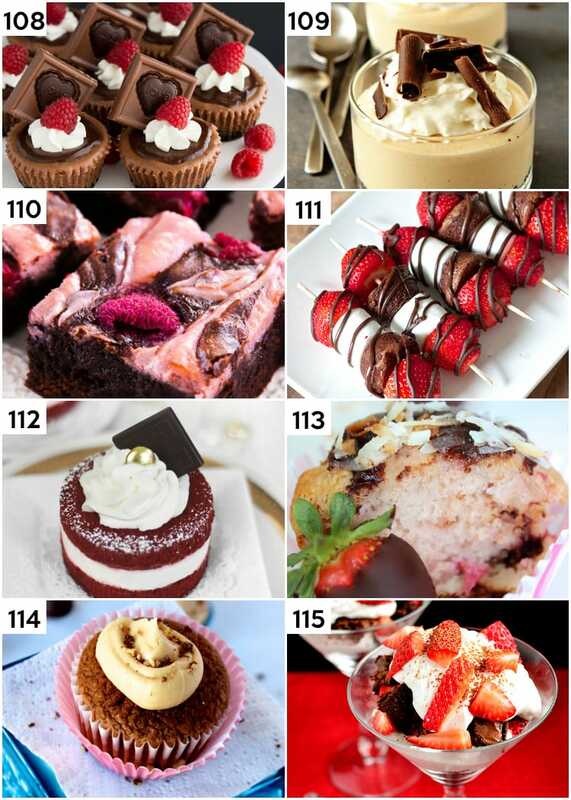 Whip up a batch of Valentine’s Day treats for when your family comes home for the day, and you’ll be mom of the year! And if you are feeling extra generous, I especially love the fun breakfast ideas! Check them out! 83. Pancake Hearts – These detailed pancakes would make for a breakfast almost too pretty to eat. 84. Potato Hearts – Delicious baked potatoes in the shape of hearts. 85. Dippy Egg Hearts – This is our kid’s favorite breakfast using a cookie cutter! 86. 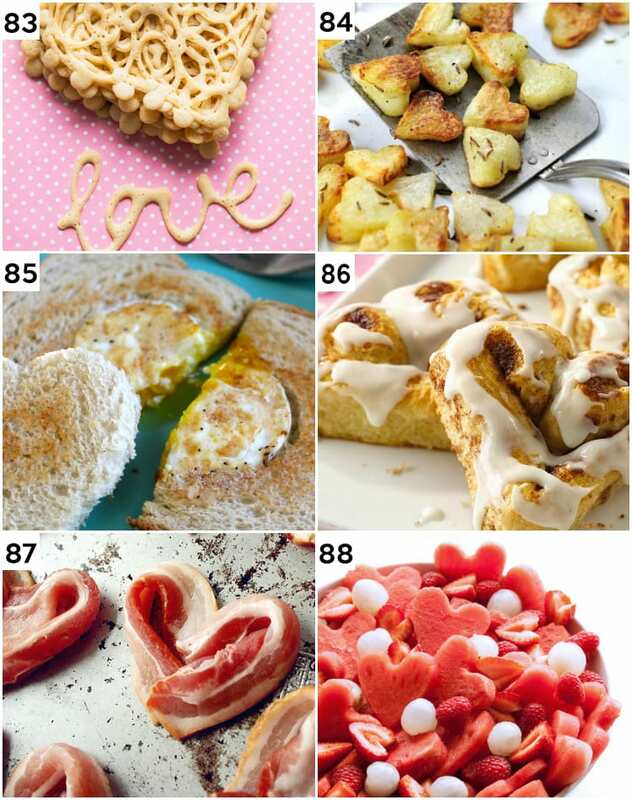 Cinnamon Roll Hearts – What an easy and fun breakfast idea. 87. Bacon Hearts – How could you beat bacon in the shape of hearts?? 88. Heart-Shaped Fruit Salad – We just had to include something a bit healthier for a breakfast treat. This fruit salad looks like a winner! 89. Giant Peanut Butter Hearts – A heart shaped peanut butter treat. This is the perfect treat for a peanut butter lover. 90. Marshmallow Pops – Pink marshmallow pops will make any kid smile! 91. Valentine Pretzels – Pretzels covered in white chocolate and sprinkles. Mmmm. 92. Cupid’s Crunch – Grab a handful of Cupid’s Crunch. This is such an easy and fun snack. 93. Rice Krispie Treats – Colorful, heart-shaped Rice Krispie treats for everyone! 94. Love Potion No. 9 – Grab this cute printable to dress up your drink for Valentine’s day. 95. Heart Cake Pops – These cake pops are so pretty! 96. Wafer Cookies – How easy are these wafer cookies!? 97. Heart Pretzels – Another perfectly simple chocolate covered pretzel. 98. Pink Popcorn – Delicious pink popcorn to get the party started! 99. Love Bug Fruit Cups – Send a little love bug in your kid’s lunch. 100. Strawberry Jello Parfaits – A fun and simple dessert the kids will love. We saved the best for last! After the kids go to bed, break out the real desserts for you and your Valentine. These are beautiful and romantic, perfect for your one, true love. 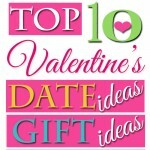 And the best part, these definitely qualify as last minute Valentine’s Day ideas! Just a quick trip to the grocery store and then you’ve got everything you need. Simple Valentine’s gifts don’t have to break the bank or take a ton of time, they can be simple, romantic and delicious for your sweetheart to feel loved! 101. Valentine’s Dessert for 2 – Super easy dessert for two. Check out these dressed up Twinkies. 102. Chocolate Dipped Cherry Meringues – These little beauties are perfect for Valentine’s Day. 103. Conversation Heart Cheesecake – This is a fun and playful romantic dessert. Make a flirty cheesecake for your spouse. 104. Chocolate Shortbread Cookies – These shortbread cookies are double chocolate with pretty sprinkles. 105. Red Velvet Truffles – Truffles with a pop of red color are simple and pretty! 106. Chocolate Covered Cheesecake Bites – Mini cheesecake bites would be fun to serve each other. 107. Chocolate Box – A box made out of chocolate and then filled with chocolate. This would make a chocolate lover’s dreams complete. 108. Chocolate Cheesecakes – This is probably one of my favorite Valentine’s desserts that I’ve ever had. Whip these up in a jiffy! 109. Peanut Butter Pies – Oh, delicious! Smooth, rich and creamy! 110. Raspberry Cheesecake Brownies – These Raspberry Cheesecake Brownies are beautiful and would make the perfect finish to a special dinner. 111. Strawberry Brownie Kabobs – Super easy and romantic dessert! 112. Mini Red Velvet Cakes – Here is a fancy dessert for the two of you to share… or maybe not! You might want to have your own! 113. Chocolate Covered Strawberry Muffins – Chocolate covered strawberries are one of the most romantic treats… these muffins are just as sweet. 114. Nutella Surprise Cupcakes – A delicious Nutella cupcake with a surprise kiss inside. 115. Brownie Trifles – Another perfect pairing of strawberries and chocolate. Make this the best Valentine’s Day yet with some of these fun and easy last minute Valentine’s Day ideas! We are all busy, so finding a way to celebrate the holiday that keeps it simple and doesn’t cost a fortune is everything we need. Simple Valentine’s Day gifts don’t have to be meaningless… you just have to think outside the box! And this post helps you do just that. If you are still looking for some fun and easy but last minute Valentine’s Day ideas, be sure to check out How to Have a Romantic Valentine’s Dinner at Home and The Top 76 Valentine’s Day Date Ideas. WOW! What an awesome list! I just printed a ton of the crafts and printables and will definitely try some of the treats. Thank you so much! Nice tips about home decor. It is very informative tips. Thanks for sharing this information with us.